MANHATTAN — As radiation levels reach an all-time high near the Fukushima Nuclear plant in Japan, nearly 200 New York artists will donate their work Thursday to help the victims of the country's earthquake and tsunami. 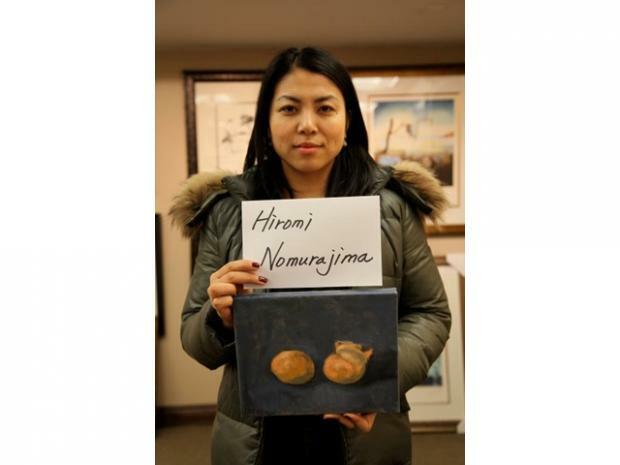 "I just couldn't do nothing," said organizer and Japanese artist Yuka Imata, who is participating in the fundraiser, "Art For Japan," at Studio 57 Fine Arts on West 57th Street. "I needed to do something, anything to help." Imata said she was motivated because she has family friends who are already devastated by tsunami damage and are now terrified over the possibility of radiation exposure from Fukushima. Her close friend's mother, a woman she calls family, is now scared to step outside and just waits for any word of evacuation, Imata says. "Being away from home and not being able to get information all the time, it makes me really worried. I can't look at the news 24/7," she said. "I just couldn't do nothing. I needed to do something about it." Although some of the artwork was originally priced at over $8,000, all of the pieces will be donated for free to sell for no more than $200. All proceeds will be donated to UNICEF's Japan Relief Efforts. All of the organizing artists currently live in New York, but many, like Imata, say they have very close and personal connections to Japan. The collection includes pieces like a black and white sketch of an infant nursing by famed artist Harvey Dinnerstein, a blue, red and yellow piece by abstract painter Ronnie Landfield, watercolors donated by Frank O'Cain, and 3-D art by Hiromi Norumajima. Imata says the grassroots effort has grown exponentially in the two weeks that they had to plan the event. Despite the fact that organizers were relying on word of mouth to get the message out, they anticipate having over 200 participants and raising over $3,000, with additional support by the Art Students League of New York. The event's organizers say they're already overwhelmed by the community's response. In March, shortly after the biggest earthquake to hit Japan initiated a giant tsunami that left 350,000 homeless and at least 10,000 dead, New York's Japanese community was quick to respond by organizing funds and assisting with relief. "It's surprising how many people are participating," one of the show's organizers, Astoria resident John Baber said. "It's just so beautiful. I'm really surprised at how helpful everyone's being for the spirit of the Japanese community." Art for Japan will be held at Studio 57 Fine Arts on 211 W. 57th Street Thursday from 6 to 8 p.m.